If you've traveled in Europe anytime in the last 20 years, you probably know that many of Europe's countries have open borders, without any kind of customs or ID check required to cross from one country to another. This is because of the Schengen Agreement, a 1985 treaty that has since been expanded and made into a law of the European Union (EU). 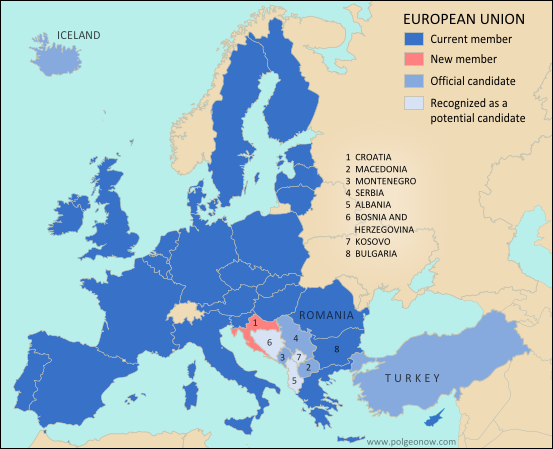 The combined area of all the participating countries is known as the "Schengen Area", and is now a core part of the EU system. For the purposes of most travelers, the Schengen Area might as well be just one country: not only have border checks been mostly eliminated (until recently), but a visa to any Schengen country is also good for travel to all of them. Each of the Schengen countries is small compared to the world's largest countries, like the US and China. But in total, the Schengen Area has more people than US, and a land area about half as big as the US or China. Schengen Area vs. European Union: What's the Difference? Although the Schengen Area and the EU are closely connected, they're not the same thing. 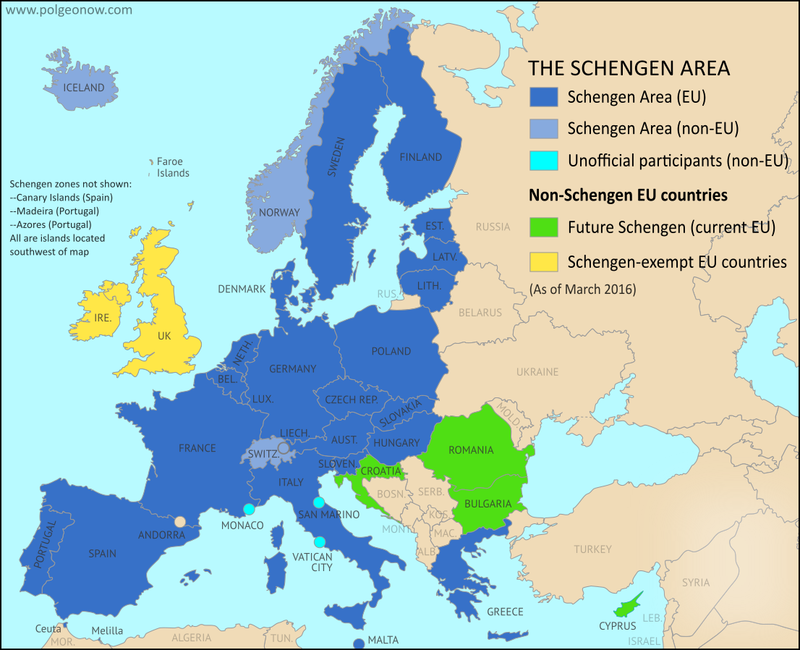 Some countries are part of the EU, but not the Schengen Area, while others are part of the Schengen Area, but not the EU. The most important difference is that the EU is much more than just the Schengen Area: it's also an economic union, with unified customs and tax laws and its own currency, as well as a political union with an elected government that manages shared laws and foreign policy for all the member countries. The Schengen Agreement was originally a treaty completely separate from EU law, but is now operated and regulated by the EU government. (Awkwardly, the non-EU Schengen countries now have barely any say over the rules and administration of the area, though they're welcome to leave any time). There are 26 official Schengen countries, all of them in Europe. The only parts of the Schengen Area outside of Europe are: (1) the Canary Islands, a part of Spain off the coast of West Africa; (2) Madeira a part of Portugal also made up of islands off West Africa; (3) the Azores, a part of Portugal made up of islands far out in the Atlantic Ocean; and (4) the cities of Ceuta and Melilla (and presumably nearby uninhabited territories) which are part of Spain but located on the coast of North Africa. *Ceuta and Melilla are two cities on the coast of North Africa that are part of Spain. They are officially part of the Schengen Area, but still have border checks for travelers going from the two cities to other parts of the Schengen Area. This is for enforcement of a special Spanish law that allows some Moroccan citizens to visit Ceuta or Melilla - but not the rest of the Schengen Area - without a visa. Which EU Members Aren't Schengen Countries?